There is no sealcoating, asphalt and or concrete repair project too big nor too small for us! Every project is unique, and we understand the value of time and money. Our senior estimators provide honest, competitive bids for each job and our team will work efficiently to get your job done on time. When it comes to asphalt installation or repair, sealcoating and/or striping, we excel and stand behind our workmanship. 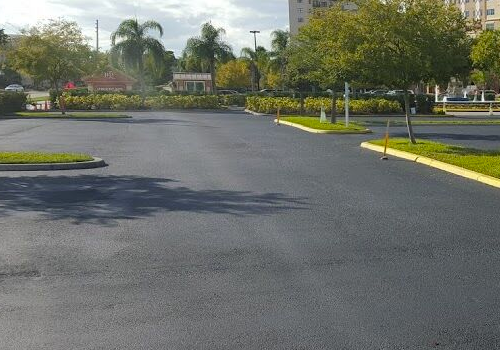 Commercial seal coating and parking lots are our specialty in both Orlando and Chicago! If you are looking for long-lasting seal coating work that will protect your asphalt surfaces year after year, Miller Seal Coating & Striping is the only call you’ll ever have to make. Periodic asphalt maintenance such as seal coating will extend the life of the asphalt up to 30 years. It is the protective coating that prevents the oil, gas, and sun from damaging the asphalt. It will restore the rich black color, which is aesthetically pleasing. It will also restore the surface binder which promotes the structural integrity of the asphalt pavement. 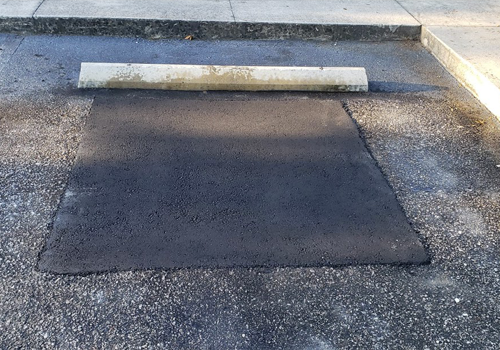 Depending on the amount of traffic volume at your facility, asphalt should be re-sealed every 2-3 years. Seal coating also saves numerus commercial property owners from spending money on costly asphalt repairs. Why not Contact Us while you are here today? 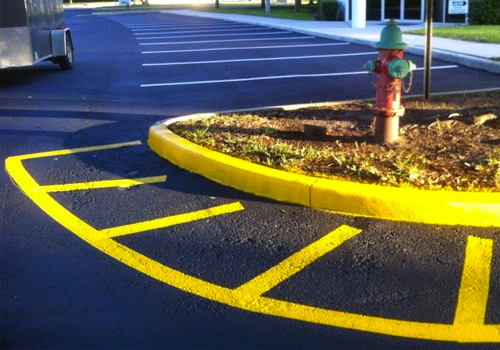 Parking lot striping is a true art, and we’ve been a leader for over 50 years in both Orlando & Chicago! New line striping services from Miller Seal Coating & Striping will not only make your streets and parking lots look better, but also make them a lot safer too. Faded lines are difficult to see, cause confusion, and can lead to minor and major traffic accidents. New striping lines will remove this danger altogether! We specialize in establishing – maximizing and maintaining the integrity of your parking lot flow. A well-executed striping plan from Miller Seal Coating & Striping does much more than enhance the aesthetics of your parking area. Proper striping improves public safety, streamlines traffic flow, and enhances the usability of your paved surface. Clearly marked stalls, handicap spaces, and directional arrows, all make for a more efficient and problem-free parking lot. Whether your lot requires a simple restripe or a complete layout design, we have the experience and knowledge to get the job done right! Contact Us today! At Miller, we’ve completed paving projects for commercial buildings, apartment complexes, retailers, grocery stores, schools, condos and much more! When it comes to managing your commercial property, curb appeal plays an important role in drawing in customers, business associates and employees. Managing a property comes with plenty of responsibilities, and you must remember that a beat-up parking lot affects more than just aesthetics. It also creates a liability issue. A well-maintained parking lot protects your customers from trip-and-fall injuries and vehicle damage. Our experience includes resurfacing projects for commercial buildings, apartment complexes, retailers, grocery stores, schools, condos/apartments and much more! 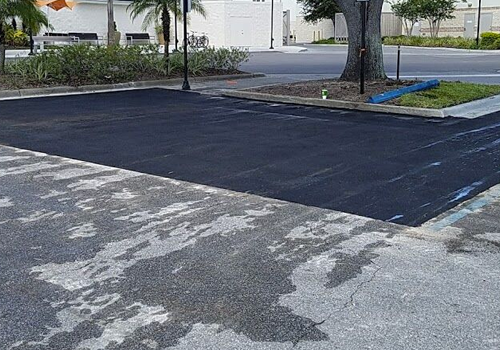 Miller Seal Coating & Striping provides an extensive range of asphalt paving and maintenance services for industrial and commercial customers throughout Florida and the Chicago region. With over 50 years of experience in the asphalt paving industry, our team will provide excellent quality, satisfaction, and performance while getting your project done right the first time. To request a Free Estimate for your next project, please Contact Us while you are here today! Contact Us today because, seal coating and hot crack filling is the best way to protect your asphalt for many years! A pothole repaired by Miller is a pothole that won’t need attention anytime soon! Potholes are not only an annoyance but can also be a potentials danger to drivers and their vehicles. 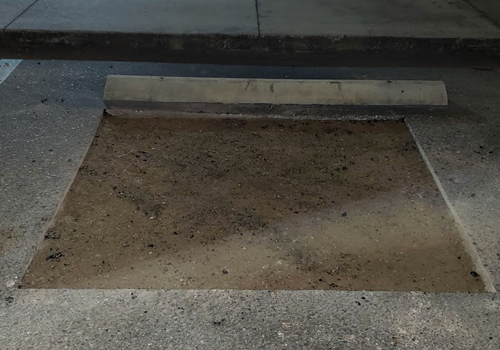 In order to maximize the life of your asphalt parking lot, it is important to develop a pavement management plan involving routine inspections and ongoing preventative maintenance. Potholes are the most common form of asphalt failure that require immediate repair and/or asphalt replacement. Potholes are open holes where the asphalt has not only cracked but broken away and separated from a section of the asphalt mat, creating a void and exposed base rock. Luckily, potholes in asphalt can be fixed relatively easily via localized patching. How the patch is completed will determine if it will hold up to new traffic loadings and weather, or if it will fail again. This is where Miller Seal Coating & Striping come in! If you’d like to take care of your potholes the right way the first time, Contact Us today! 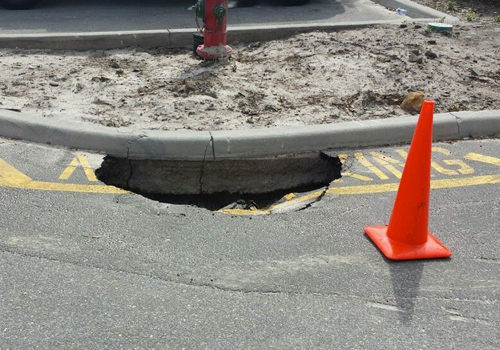 Miller concrete repair for curbs and sidewalks in both Chicago and Orlando. Miller Seal Coating & Striping also offers comprehensive curbing and sidewalk repair in both Florida and the Chicago region. If your curbs and sidewalks are beyond repair, we can install brand-new curbs and sidewalks for your property. We will restore their structural integrity as well as their appearance! 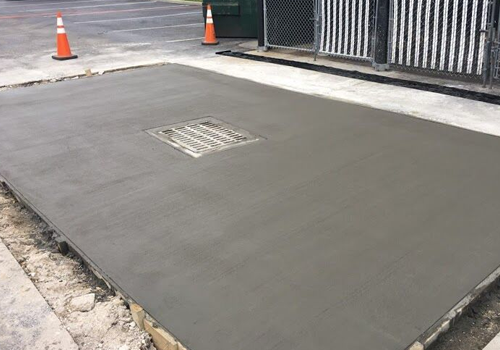 Miller Seal Coating & Striping is the number one choice when you need experienced and efficient concrete contractors in Florida and Chicago (and the surrounding areas). Don’t wait, Contact Us while you’re here today! 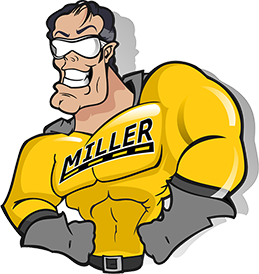 Miller is fully knowledgeable in the latest ADA-compliance requirements! Parking lot compliance is a federal requirement as of March 2012 and violations can be extremely costly not only in fines, but also in potential lawsuits or facility downtime. The American Disabilities Act (ADA) requires that when a business restripes a parking lot, it must provide accessible parking spaces as required by the ADA Standards for accessible design. The requirements are very specific including location, width and number of spaces as well as removal of accessibility barriers. Not meeting these standards could result in hefty fines and penalties. Miller Seal Coating & Striping provides parking lot striping services for public and commercial properties throughout Florida and the Chicago region. Our competitively-priced paving solutions pay careful attention to safety and durability reducing the risk of accidents and injury. We are fully knowledgeable in the latest ADA-compliance requirements, which enables us to help our customers reduce their liabilities and keep in compliance. Miller Seal Coating & Striping parking lot striping services will make your property safe and ADA-compliant. We can even provide you with a complete maintenance plan to ensure your property is properly paved and clearly marked in all seasons throughout the year. 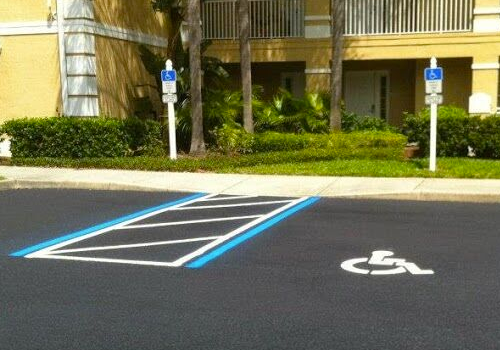 For experienced, ADA-compliant parking lot striping services from Miller, Contact Us today! There is skill involved with installing a speed bump, and Miller has it! If driving slowly for safety reasons are a major concern, Miller Seal Coating & Striping can provide you with speed bumps to slow those speeders down so that people and property in the surrounding area are protected. Speed bumps are often seen as essential elements in areas where slowing traffic down is desired, if not necessary. While these bumps in the road may appear simple, if not effortless to construct, the opposite is true. 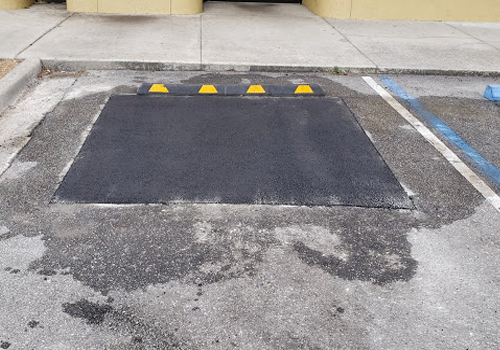 There is skill involved with installing a speed bump and the inability to do a proper job can result in an ineffective solution with your speeding problems. 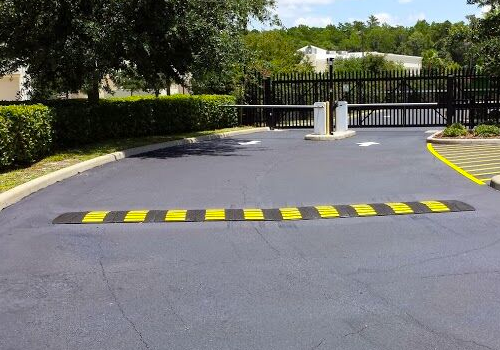 Miller Seal Coating & Striping is a professional paving company that has mastered the installation of speed bumps and will stand behind its workmanship. Contact Us today to receive your FREE Estimate!